Greet ings. 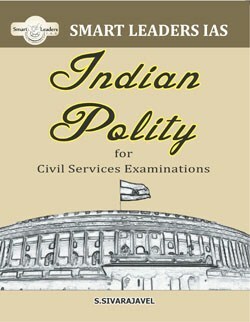 A sound knowledge in Ind ian Pol ity is not only a sine qua non for clearing the Civil Services Exam (Prelims and Mains) but it gives you a strong understanding about the administrative system of our nation. This is infact a precondition for your performance as an able administrator. This book on Indian Polity is written complying with the new pattern introduced by UPSC in 2013. The book is an attempt to make your preparation smarter. We congratulate our content team comprising of Mr. Sumeet Bafna, Mr. Suriyabharanidharan, Mr. Bernaud Thomson and Ms. D. Ramya for their enthusiasm shown to make this book a comprehensive study material for IAS Aspirants. The book has certain novel sections like “Test your knowledge”, “Comparison of world constitutions”, Polity related recent developments, etc. This Book covers the whole syllabus for Civil Services Prelims as well as Mains Exam. We would be extremely thankful to readers who could provide constructive criticism of this book. This would enable us to offer IAS aspirants the best study material on Indian Polity.